You probably know that the World Cup starts tomorrow when hosts Brazil take on Croatia in the opening match. 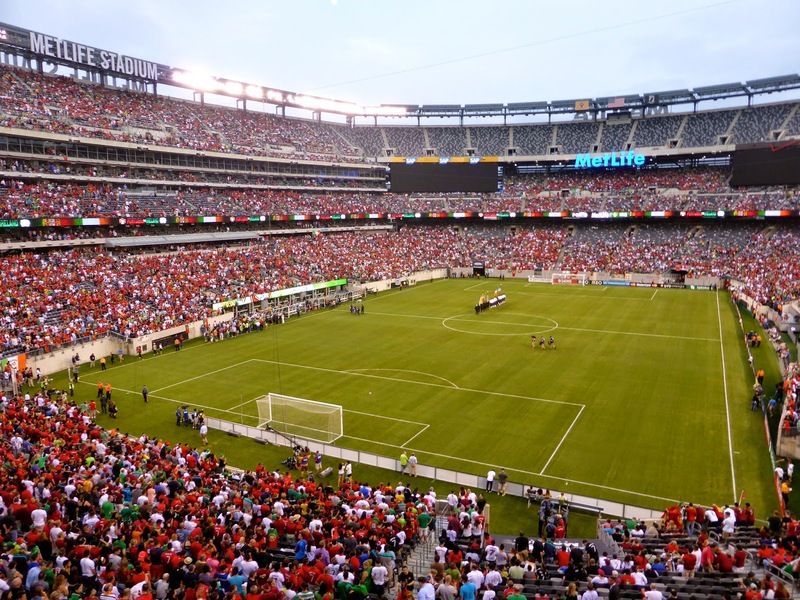 What you might not know is that the final international friendly was played yesterday as Portugal, 4th in the world according to the June FIFA rankings, took on 70th-ranked Ireland at MetLife Stadium. My buddy Andrew was in town to pick up his visa for Brazil (he is going for the semifinal games) and so we met up in Manhattan to take the train to the Meadowlands. This was my fourth visit to the stadium, with the most recent for the Super Bowl. However, this was the first time I would take the train, which was the source of much frustration for football fans back in February. This time though, with only 46,000 attending the game and many of those driving, the train was not a problem at all. 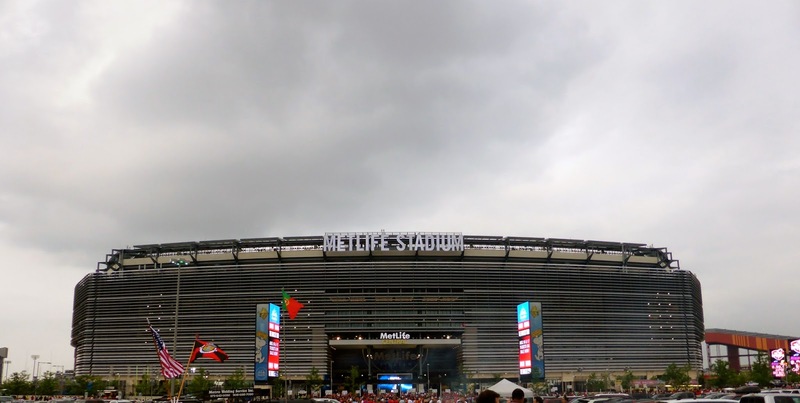 We left New York Penn Station at 6:30 pm and after a quick transfer at Secaucus, arrived at the stadium at 7 pm. The round trip ticket was $10.50. Outside, there were few fans with extra tickets but Andrew located one seller with a single seat in Section 248. He wanted $50, but with the game starting in a few minutes, he had no leverage. I bought the ticket for $20, as Andrew felt that he could in for free and wanted to keep looking. I entered and got to my seat as the Star Spangled Banner was being sung by Dominic Chianese, who played Uncle Junior on The Sopranos. The shot above is from my seat. Andrew eventually got in, finding a seat exactly two rows behind mine, although not for free. 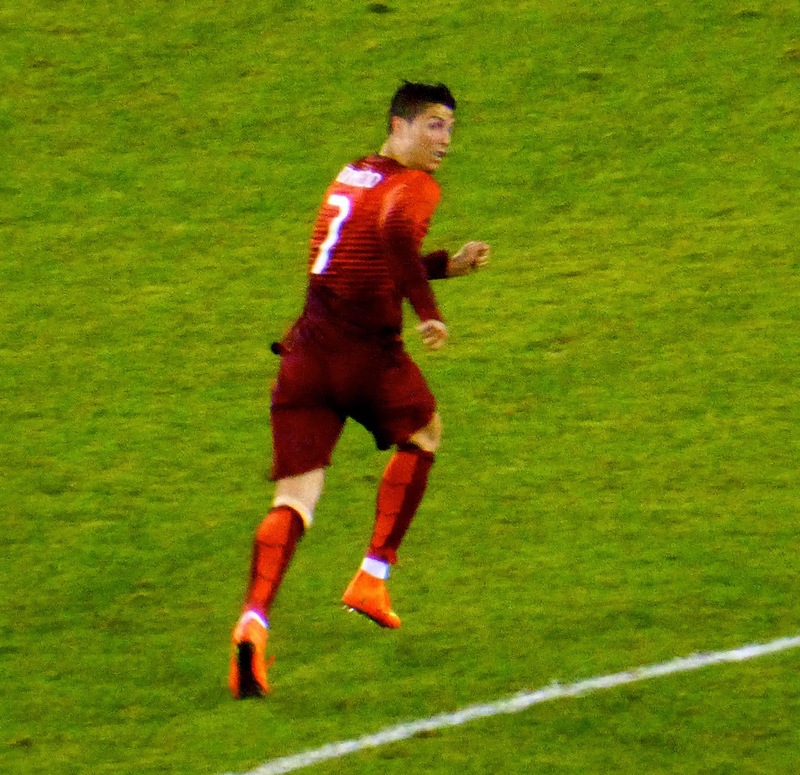 The big news for Portugal was the return from injury of Cristiano Ronaldo (above), the reigning Ballon d'Or holder as the best player in the world in 2013. It did not take him long to show his stuff as he managed a shot on goal in the first minute, and was instrumental in helping Portugal dominate the entire first half. After Hugo Almeida scored on a header just two minutes in, the Portuguese continued to press. In the 20th minute, Ronaldo completed a nifty back-heel pass to Fabio Coentrao, whose attempted cross struck the outstretched foot of Irish defender Richard Keough and looped into the net for an own-goal. Almeida added another in the 37th minute when a Ronaldo header was saved by Irish keeper David Forde, only to have the rebound fall to Almeida who made no mistake. I was sitting behind the Portuguese goal for the first half, which meant little action. 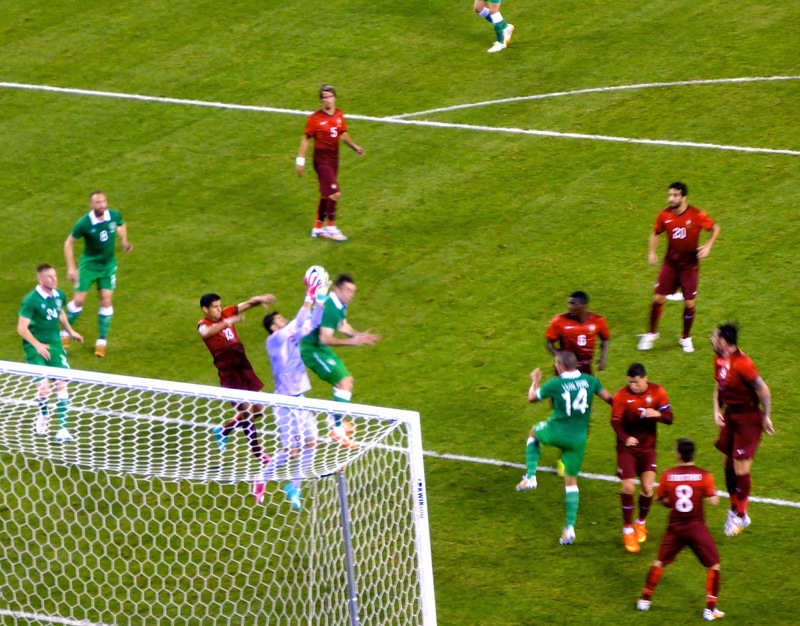 The Irish managed a corner kick but it was easily taken by keeper Rui Patricio (above). At halftime, Andrew and I switched to the other end of the field so we could get to the train quickly. Ireland got an early marker in the second half from James McClean, but Portugal added two more late in the frame, including a beautiful outside foot shot from Coentrao to finish the scoring. 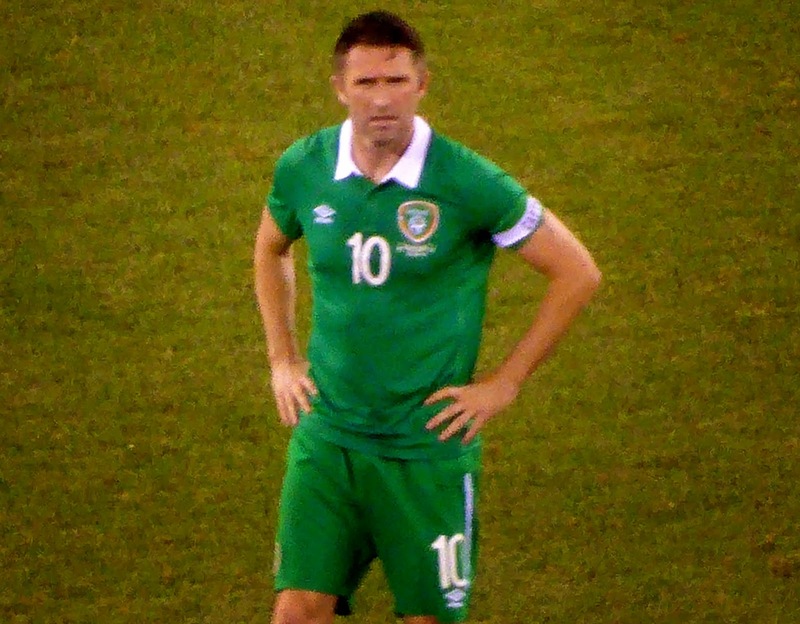 As it was a friendly, there were plenty of subs on both side, and Robbie Keane (below) made an appearance for the Irish, running around a lot but not adding much to the proceedings. It was nice to see Ronaldo return to action and I will be watching the Portuguese with interest as they play Germany, Ghana, and the US in Group G.
I get asked a lot why I don't travel to the World Cup, as it offers the best atmosphere for an extended sports road trip and gets you to some relatively exotic locales. No doubt the collection of fans from such diverse countries beats even the Olympics, and the excitement before each game is unparalleled. But I already have my World Cup experience. When Japan hosted the event in 2002, I was fortunate work for FIFA as a reporter at all eight games in Saitama and Yokohama, including the final. After watching most of the game from the press box, I would head to the mixed zone (where the players and media mingle for post-game interviews). My job was to stand next to the players and record questions from the media and the players' responses. This information was entered into a proprietary system so that reporters at other venues could use the quotes in their articles. It was an amazing experience, particularly after the final when I was one of about 200 people in the mixed zone as the Brazilians ran through with the trophy, cheering loudly all the way. After that, there is no need to pay thousands of dollars to be a "regular" fan, especially when Canada is not participating. Should they make it to Russia or Qatar, then I will consider revisiting the World Cup.